In any case, we have had great fun building the site on Oracle Application Express, packed full of PL/SQL APIs. And hundreds of developers have told us how much they have enjoyed and benefited from what I call "active learning" - not just reading a book or watching a video, but challenging oneself to test one's knowledge (and, if you like that sort of thing, competing with others). Yes, competing. Humans love to compete (some of them, mostly I suppose men). They love to be ranked. They love to win. And we give them that opportunity on the PL/SQL Challenge. 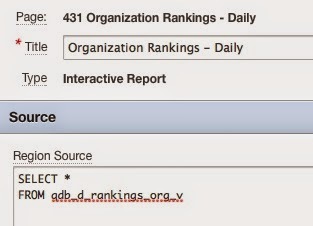 We offer lots of different kinds of rankings: by player, by country, by company, by affiliation (e.g., user group). You can choose the competition, the date range, etc. Because of this wide variety, we decided to utilize APEX's fantastic Interactive Reports feature. And suddenly we (with Eli definitely taking the lead here) were sure (desperate) that there had to be a better way, and we'd better figure out what that better way was. Ideally, we would have just one report that would handle all of the variations we needed, in a way that the users would find easy to use. Ideally, we would have a single view and just pass "parameters" to it, to alter its behavior and change the result set returned. Sadly, views do not take parameters. But, wait....functions take parameters. If only we could call a function in the query.....well, we can! We can call a table function! Now, some of you might be thinking: why would you need a table function? Why not just use a series of "mutually exclusive" queries combined with a UNION ALL? I expect you get the idea from there. It's a long query (well, 143 lines, not all that crazy long), but it's fairly straightforward. No need for a table function. When it came to the other reports, however, the table function came in very, very handy - because the logic and variations between the reports was more substantial. In this post, I will explore how we applied table functions in our application, and go as far as the specification of the table function. In my next post, I will dive into the implementation of that function. 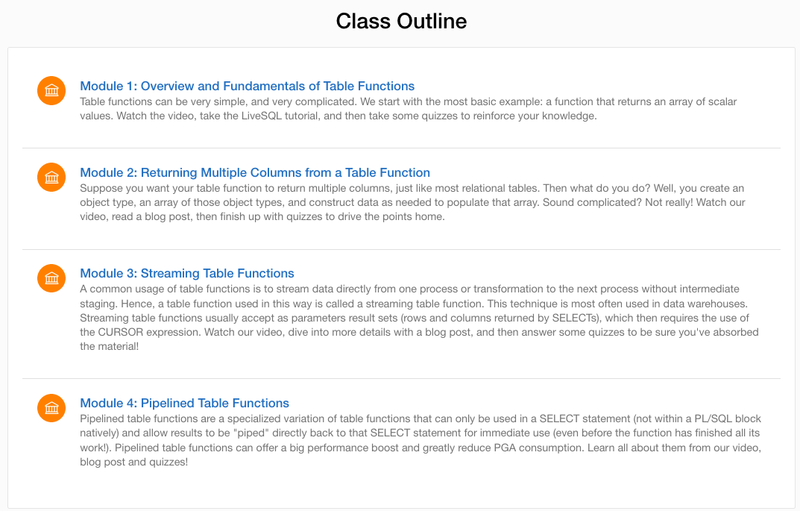 Hopefully you can see why we talk about queries based on table functions as a kind of parameterized view. I am passing argument values to the parameters of the function. 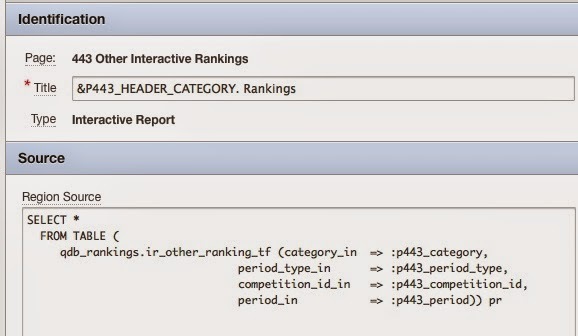 The function then returns the dataset as rows and columns. So from the standpoint of a developer building the report, we have kept (made) things very simple. All the complexity has been moved inside the function. Then I define a function that accepts the necessary parameters and returns a collection of that type. So the public-facing side of my function is done. Time to dive inside! Unfortunately, I lead a busy, busy life at Oracle and right now I am on deadline to complete my next article for Oracle Magazine. Consequently, please accept my apologies for publishing this post without getting into the "good stuff." I promise that it is coming right along!